A healthy dose of pharma stocks in your portfolio can be a good defensive strategy in this volatile market. On June 11, the promoters of India’s premier drug maker Ranbaxy handed over effective control to Daiichi Sankyo, a Japanese pharmaceutical giant. The deal, which brings together a generics powerhouse and a pharmaceutical innovator, is expected to spur the interest of global drug majors in Indian pharma companies. But, more importantly for the investor, it is set to bring back in focus the potential of the sector and its stocks. 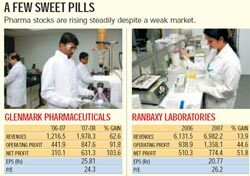 After languishing in 2007, the pharma sector has bounced back recently and even outperformed the broader market . Analysts see pharma stocks as a defensive sector in this market, and with good reason. Says Alok Gupta, Executive Vice President & Country Head (Life Sciences & Technology), YES Bank: “The cash flows of pharma companies and their growth prospects look robust. This is because a number of companies are getting into niche market opportunities in the R&D services, CRAMS (Contract Research and Manufacturing Services) or healthcare services spaces.” Besides, the sector’s fortunes are not necessarily linked to the highs and lows of the economy— demand will remain strong as long as people fall ill.
Key Indian players like Ranbaxy, Dr Reddy’s and Sun Pharma are persistently trying to tap the growing opportunities in generics. Patents on drugs with an estimated market of $40 billion (Rs 1.72 lakh crore) are set to expire in 2008 and 2009. When the generics market for these opens up, this will translate into an opportunity of $2-3 billion (Rs 8,600-12,900 crore). Therefore, companies have been fine-tuning their strategies and some have focussed on only those products that have a smaller value but lower competition as it is more lucrative to operate in markets with only one or two players. Then, while the global generics market is still evolving, the growth prospects in India and other emerging markets remain bright. YES Bank’s Gupta expects the domestic pharmaceutical market to grow at between 10 per cent and 11 per cent annually over the next 10 years, compared to the 9.5 per cent growth per annum the Rs 30,000 crore industry has been recording over the past five years. The key drivers here will be branded formulations and healthcare services. Analysts have been closely tracking top pharmaceutical companies like Sun Pharma, Ranbaxy, Cipla, Glenmark and Dr Reddy’s. Although Dr Reddy’s has posted a decline in its profits in the just-concluded financial year, analysts intend to closely watch the company as the management expects it to bounce back in 2008-09 and register a 25 per cent growth in sales (in rupee terms) along with “substantial improvement” in profitability. The turnaround is expected from the third quarter of 2008-09, when it begins to exclusively distribute an authorised generic version of Sumatriptan Succinate tablets, the generic version of Glaxo-SmithKlines’s Imitrex (R) tablets used for treatment of acute migraine. Imitrex recorded sales of $962 million (Rs 4,137 crore) in calendar year 2007. Glenmark Pharmaceuticals: This fast-growing pharma company plans to establish 4-5 distribution frontends in western European markets over the next three to five years either through acquisitions or by opening outlets to market its products directly. It also plans to develop niche generic products via alliances with European Union companies. The company has maintained a strong earnings momentum. Its reorganisation, which includes segregation of its generics business from its specialty and proprietary drugs business, is expected to unlock huge value. It has divided itself into two main businesses of specialty and proprietary drugs under Glenmark Pharmaceuticals and generics under a wholly-owned subsidiary, Glenmark Generics. The company’s goal is to become a global end-to-end specialty player in the former, and a globally integrated generics and API leader in the latter. Ranbaxy Laboratories: Following the deal with Daiichi Sankyo, Ranbaxy Laboratories will strengthen its balance sheet and clear its debts, which is a huge positive for the company. It also stands to gain from the enhancements that are now likely in its drug discovery pipeline. Also, Ranbaxy now gets a good platform for entry into the lucrative Japanese generics market. Then, its API and formulations businesses could benefit from the supplies that it may now have to make to meet Daiichi-Sankyo’s global needs. Sun Pharma: Sun Pharma has been in the news for its ongoing tussle with Taro, following the latter’s move to terminate the merger agreement between the two. But away from the arclights, the company has been maintaining a stable momentum in its core business. In its guidance for the next year, it says it expects its non-US business to grow 18-20 per cent. In the US, it expects 25 per cent growth. The company has a comprehensive range of products, a mix of high volume and complex products, which bodes well for the future.